WALLKILL,N.Y. - Don Crawford comes from a long line of Orange County farmers. Though he no longer tends dairy cows, he still cuts hay for the thriving equestrian industry, and cringes at the creep of the suburbs. So when a stranger came to town and announced plans to grow marijuana on the fallow land next to his, Mr. Crawford was thrilled. And it would be legal. The prospective farmer, Erik Holling, a former chief operating officer of a technology company, is vying to become one of five registered producers of medical marijuana — or medical cannabis, the term favored by those in the trade — permitted under a New York State law coming into effect. The enthusiastic local reception that Mr. Holling’s company, Valley Agriceuticals, has received offers a case study in how the public perception of medical marijuana has changed, and how some communities have come to view it as a potential economic boon. 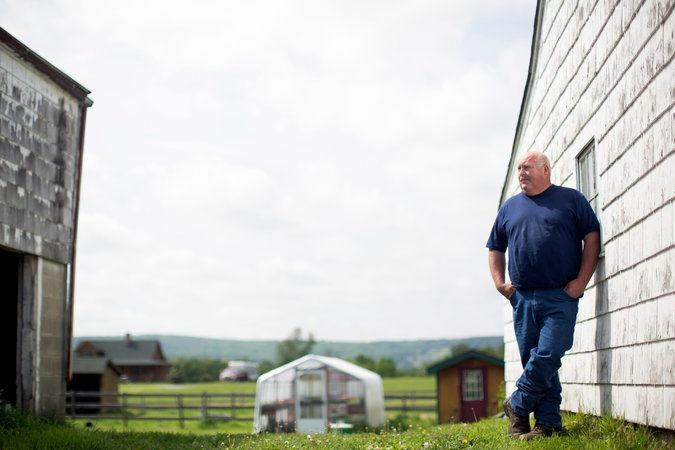 The town supervisor, Daniel Depew, 34, saw the marijuana farm proposed by Valley Agriceuticals as a way of preserving open space while creating jobs. In a similar vein, Mr. Depew recently visited Wisconsin in a bid to attract a water park to the blighted county fairgrounds in Wallkill. Mr. Depew was a 4-H member and raised heifers as a child. He said he would have welcomed other crops — “tulips, geraniums” — but none were offered. Given the town’s history, he added, what could be more appropriate than medical marijuana, with its blend of horticulture and health? Mr. Depew said that, if approved by the state, Wallkill’s marijuana operation would not be a shady-looking den of indoor grow-lights behind barred windows. Rather, he said, Valley Agriceuticals had agreed to build greenhouses and a red barn with cupolas, and to take advantage of a natural dip in the earth to keep its buildings out of sight inside a ring of trees. As of now, doctors can prescribe the drug’s use to treat only 10 conditions, including cancer, H.I.V./AIDS, multiple sclerosis, Parkinson’s disease and epilepsy; even then, patients must have specific symptoms and functional limitations. Several local jurisdictions have nonetheless endorsed prospective medical marijuana ventures, either through formal resolutions or through the support of elected officials. Besides Wallkill, they include the towns of Lewiston, Chazy, Romulus and Wilson; the villages of Wolcott and Newark, N.Y.; and the city of Utica. Compassionate Care Center of New York, run by a gastroenterologist, Larry Good, from Long Island, has leased a greenhouse in Newark, in western New York, that once belonged to the Jackson & Perkins garden company. The village’s mayor, Jonathan Taylor, remembered that in its heyday, Newark was known as the Rose Capital of America. More recently, he said, the Jackson & Perkins greenhouse has been empty, until this winter’s disastrous snowstorm in Buffalo drove another flower grower to move there temporarily. Newark, population 9,000, has an industrial park that is home to small manufacturers of 20 to 75 employees apiece, so the 100 jobs being promised by Dr. Good’s company would be significant. “Good-paying jobs, with benefits, which we’re pretty excited about,” Mr. Taylor said. Like Mr. Depew in Wallkill, Mr. Taylor also hopes to benefit from the local share of a state marijuana excise tax, though it has been hard to project exactly how much that would amount to since it will be dependent on demand. “I would be there in a heartbeat,” said another worker who declined to provide his name for fear of offending his employer. “I have no love for corrugated containers.” This worker said he was also eager for recreational marijuana to be legalized. The Crawford family has been harvesting hay and hunting deer on the land being considered for the marijuana operation, and in the interest of neighborly relations, Valley Agriceuticals promised to let them continue on the portion of the property that would not be used for growing. “Now, being that I’m going to most likely have it, it’s about like your own property, so I might want to put some lime and seed in it,” Mr. Crawford, 50, said. Tramping through damp, knee-high grass and purple wildflowers recently, Mr. Cutter pointed to old rock walls and thorn bushes, which he described as natural deterrents to intruders. He said he would add welded wire-mesh fencing that is difficult to climb or cut, as well as security cameras and motion sensors.